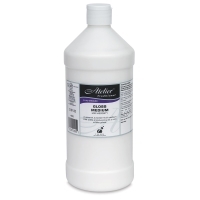 Chroma Atelier Traditional Mediums contain a traditional acrylic binder that tends to dry quickly and forms a tough, water-resistant skin. Use these acrylic mediums for traditional overpainting and layering techniques. Atelier Traditional gels and pastes are great for adding texture and structure and for extending your paints. 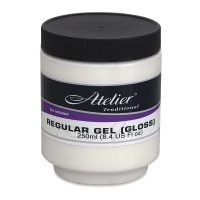 Regular Gel — Available in both Gloss and Matte finishes, this smooth, buttery acrylic gel can be used to extend acrylic paints and adjust their gloss and transparency without altering their consistency. 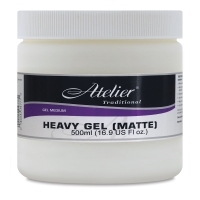 An ideal glazing medium, it also holds textures and moderate peaks for impasto effects. 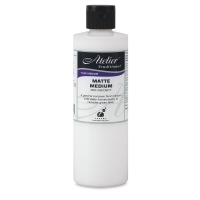 Mix it directly with acrylic paints or apply it on top of a paint layer (its milky color becomes transparent when dry). 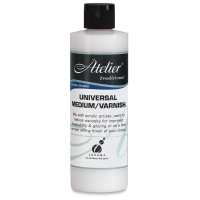 Universal Medium/Varnish — Excellent for glazing, this medium reduces viscosity and improves brushability. It can also be used as a varnish (adding water results in different levels of sheen, from low to high gloss). 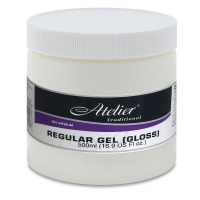 Gloss, Satin, and Matte Mediums — Offered in your choice of three finishes, these general-purpose, mid-viscosity mediums are ideal for extending colors, adding translucency, promoting flow, leveling, and glazing. They're also great for adjusting gloss levels. 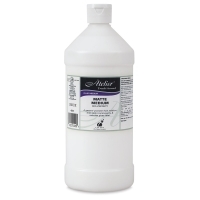 Either mix them directly with acrylic paints or use them as a sealing layer before overpainting. Acrylic Glazing Liquid — Specially formulated for creating translucent glazes, this low-viscosity medium slightly extends the open time of acrylic paints while promoting their translucency, flow, and leveling. 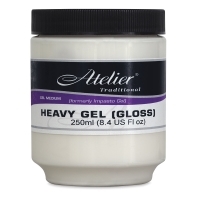 It imparts a rich, glossy, oil-like sheen that is waterproof when dry. 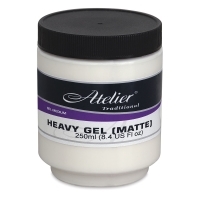 Heavy Gel — This thick, fast-drying, waterbased acrylic gel is designed to exaggerate paint structure and sharpen textural edges. 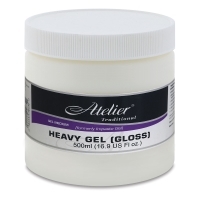 It can also be used as a very strong adhesive for bonding heavy objects. 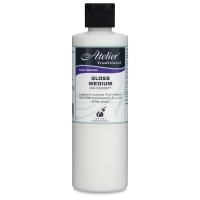 Either mix it directly with acrylic paints or apply it on top of a paint layer for transparent textural effects. It can be overpainted once dry. 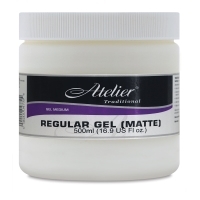 Choose Matte or Gloss (Gloss was formerly known as Impasto Gel). 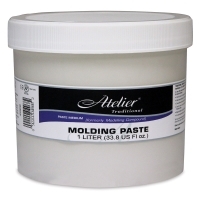 Molding Paste — This very thick, textural paste can be used to create exaggerated structure within artwork. 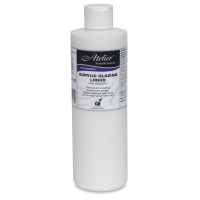 It offers the same flexibility as Atelier paints, and can be used at any stage in the painting process. 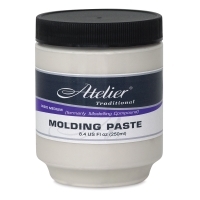 Molding Paste dries white. Mix it with paint for a colored ground, or paint over it after it dries (Paste was formerly known as Modeling Compound).